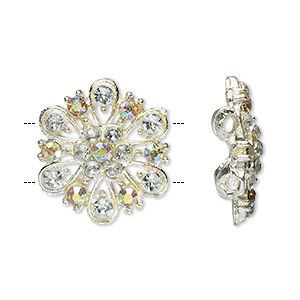 Spacer, glass rhinestone and silver-plated pewter (tin-based alloy), clear and clear AB, 17mm 2-strand round flower. Sold per pkg of 2. Item Number: H20-2899FY Have a question about this item? 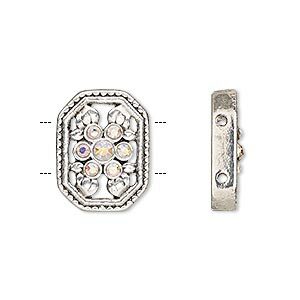 Colorful rhinestones adorn double-drilled, pewter (tin-based alloy) beads. Flashy beads add the perfect amount of glitz to bracelet designs. 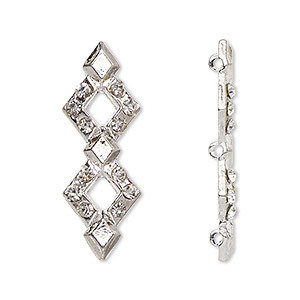 Package includes two matching spacers. Colors, shapes and sizes may vary in each lot..
Spacer, glass rhinestone and antique silver-finished "pewter" (zinc-based alloy), clear AB, 18x14mm single-sided 2-strand octagon with flower and leaves design, fits up to 7mm bead. Sold per pkg of 2. 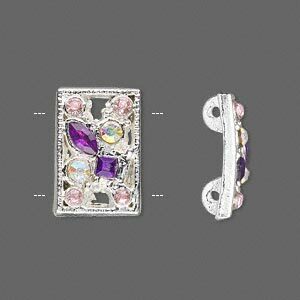 Spacer, glass rhinestone and silver-plated "pewter" (zinc-based alloy), clear AB and purple, 18x12mm curved rectangle. Sold per pkg of 2. 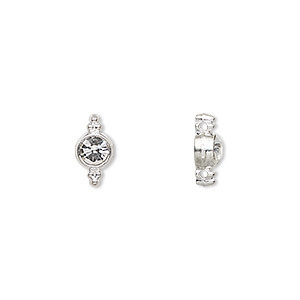 Spacer, glass rhinestone and silver-plated "pewter" (zinc-based alloy), clear, 11x6mm 2-strand, fits up to 6mm bead. Sold per pkg of 20. 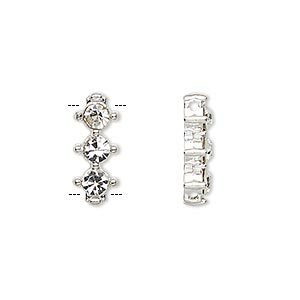 Spacer, glass rhinestone and silver-plated brass, clear, 12x4mm 2-strand half-round bridge, fits up to 3.5mm bead. Sold per pkg of 10. 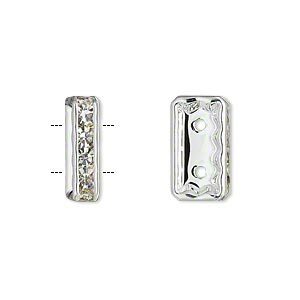 Spacer, silver-plated "pewter" (zinc-based alloy) and Czech glass rhinestone, clear, 16x4mm 2-strand rectangle fits up to 6mm beads. Sold per pkg of 2. 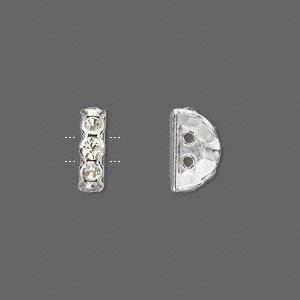 Spacer, glass rhinestone and silver-plated "pewter" (zinc-based alloy), clear, 32.5x12mm 3-strand double diamond, fits up to 10mm bead. Sold per pkg of 10. 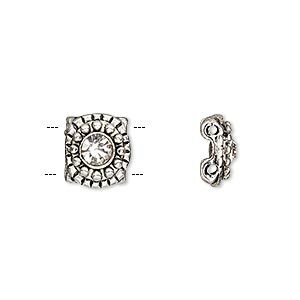 Spacer, glass rhinestone and silver-plated "pewter" (zinc-based alloy), clear, 19.5x6.5mm 3-strand, fits up to 6.5mm bead. Sold per pkg of 20. 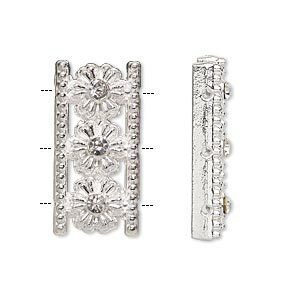 Spacer, glass rhinestone and silver-plated "pewter" (zinc-based alloy), clear, 26x13mm 3-strand with flowers, fits up to 7mm bead. Sold per pkg of 10. 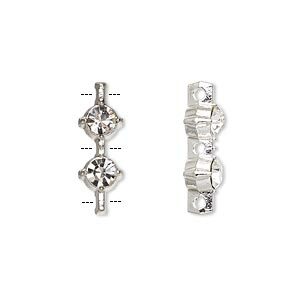 Spacer, glass rhinestone and silver-plated "pewter" (zinc-based alloy), clear, 17x7mm 2-strand, fits up to 12mm bead. Sold per pkg of 10. Spacer, glass rhinestone and antique silver-finished "pewter" (zinc-based alloy), clear, 10.5x9.5mm single-sided 2-strand beaded flower, fits up to 6mm bead. Sold per pkg of 6.